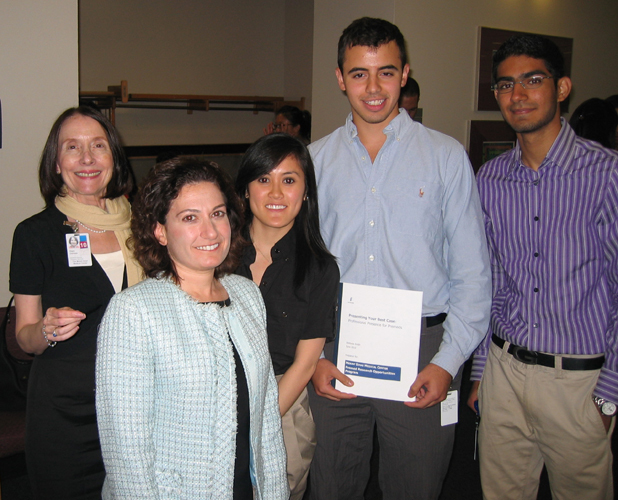 In June 2011, Stefanie Smith spoke to the Pre-Med Research Opportunity Program at Mount Sinai Medical Center in New York City. Participants were selected from a wide variety of universities and placed in laboratories performing cutting-edge research. The workshop, entitled Present Your Best Case: Professional Presence for Pre-Meds covered making a strong professional introduction, preparing briefings for Principal Investigators, interviewing and resume writing. Dr. Maria Diaz emphasized the medical value of gaining immediate respect from patients in terms of trust, compliance and clinical results. At the end of the summer, the students presented their experiences and results before the group, faculty and guests, highlighting the value of the new skills they acquired. 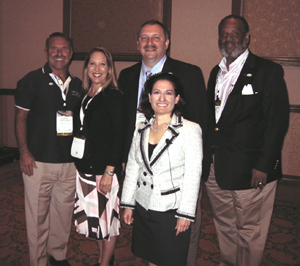 The New Jersey Society of CPA’s held their 5th Annual Convention and Expo on June 2-4, 2010. More than 500 attendees included audit firm partners, corporate CFO’s, attorneys, professors and a broad range of accounting professionals. Frank Abignale, who wrote Catch Me If You Can, was the keynote speaker. He transfixed listeners with descriptions of his criminal past and responses to the very latest risks and responses to check fraud, forgery, embezzlement, counterfeiting and identity theft. 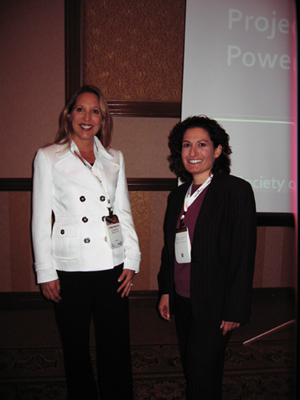 Jonna Martin of AdvanceMe Associates and Stefanie Smith combined their complementary expertise and styles in program on Executive Presence attended by over 90 members. Ms. Martin is a recognized leader in this field and speaks regularly to corporations and professional groups including Heinz, Unilever, KPMG, and Carnegie Mellon University. She led an interactive discussion covering insights and practical tips on the power of image, navigating email exchanges, dining etiquette and best networking practices. Stefanie concluded with a hands-on start to honing a working pitch to prepare participants to make strong impressions on new acquaintances or longtime colleagues and clients. In a targeted session for over 100 NJSCPA leaders, Stefanie Smith presented Build Your Leadership Assets, emphasizing “Some people are born to lead. All people are born to learn. 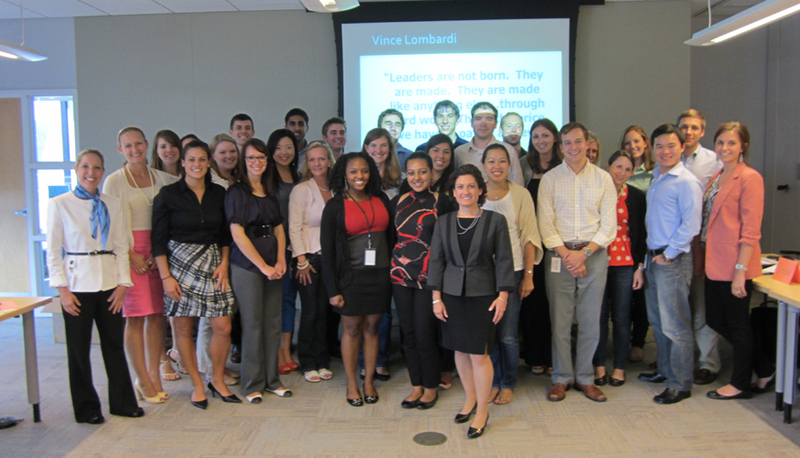 You can learn to lead.” This workshop addressed why leadership derives from who you are as a person and how both teaching and learning from your team maximizes mutual success, competence, trust and pride. Drawing from her recent Amp-Up Your Leadership series published by the American Management Association. She recommended ten guiding principles and offered a game plan guiding participants to set their own standards and take the next step towards reaching their leadership aspirations. Jonna Martin and Stefanie Smith, with NJSCPA Past President-Bob Traphagen, President-Robert Marrone, and Executive Director-Ralph Albert Thomas. Jonna Martin and Stefanie Smith. 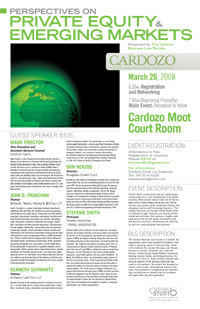 On March 26, 2008, the Business Society of Cardozo Law School presented an event on Perspectives on Private Equity and Emerging Markets. Over 100 attorneys, investors, law students and business school students attended. The audience included professionals from Merrill Lynch, Credit Suisse, Fried Frank, Travelers Insurance, Baker & McKenzie, Torys, Morrison & Foerster and other firms. Stefanie Smith of Stratex Consulting moderated the event, balancing business and legal perspectives and contrasting strategies of larger and niche players. The panelists were: Mark Proctor - Vice President, Assistant General Counsel, Goldman Sachs; John D. Franchini - Partner, Global Corporate Department, Milbank, Tweed, Hadley & McCloy LLP; Don Herzog - Director, Bluegrass Growth Fund; and Kenneth Schwartz - Partner, Schwartz Law Firm, LLC. The discussion began with each panelist presenting a case story about a recent transaction to demonstrate a current private equity trend, risk or reward. Then the panel explored trends in emerging markets private equity: areas of greatest opportunity; how domestic and overseas economic factors, cultural differences, and political risk affect investment choices; and how U.S. private investment impacts emerging markets beyond financial returns. To close the program, audience members were invited to ask questions and network with the panelists at a lively reception following the presentation. Mark Proctor, John Franchini, Stefanie Smith, Don Herzog, and Kenneth Schwartz. 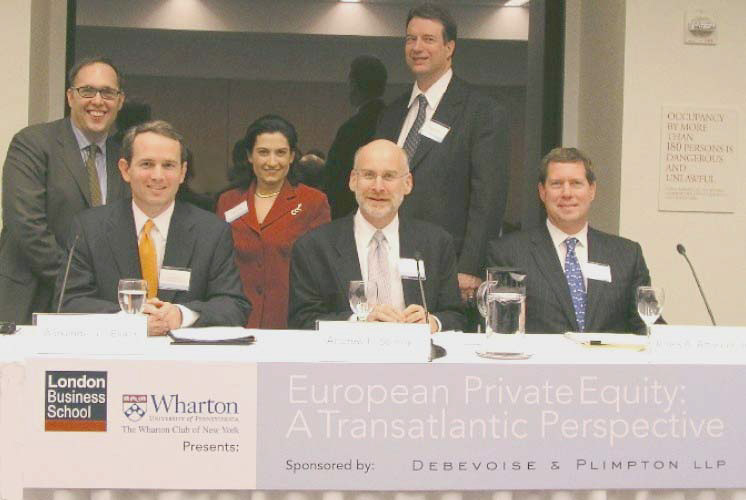 Over 125 professionals gathered for a program on European Private Equity: A Transatlantic Perspective, presented by the London Business School New York Alumni Association and the Wharton Club of New York. Participants enjoyed cocktails, networking, a panel of distinguished speakers, and a full reception hosted by Debevoise and Plimpton LLP. The panel presentation reflected real-world perspectives of private equity professionals from Providence Equity Partners and The Carlyle Group with extensive cross-border transaction experience. The audience represented alumni from London Business School, Wharton, Stanford GSB, Harvard Business School, INSEAD and LSE, and over 100 companies ranging from boutique capital funds to the largest global investment banks including Goldman Sachs, Deutsche Bank, JP Morgan, Lehman, and Credit Suisse. This event was chaired by Stefanie Smith and Michael Rycheck, Wharton/London Business School ’92 and Robert Schneider JD/MBA University of Pennsylvania ’79. Event chairs with panelists: Alex Evans, Providence Equity Partners; Andrew Sommer, Debevoise & Plimpton LLP; and Jim Attwood, The Carlyle Group. 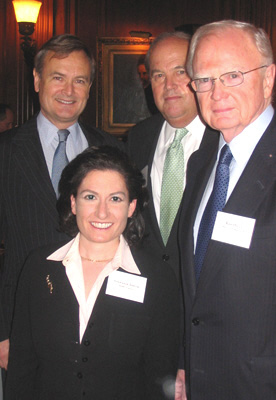 On May 23, 2005, the American Assembly sponsored a symposium on “The Future of the Accounting Profession: Auditor Concentration” co-chaired by Roderick M. Hills, former SEC Chairman, Partner, Hills & Stern, Audit Chair of Chiquita Brands International and J. Michael Cook, former Chairman and CEO, Deloitte & Touche, Audit Chair of Comcast and International Flavors and Fragrances, Board Member of Dow Chemical. Prominent business leaders, policymakers, academics, and journalists met to explore implications of the current level of concentration and potential workable solutions. The resulting report has attracted considerable regulatory and press interest, from the current SEC Chairman to the International Herald Tribune and Financial Times. Stefanie Smith played a key role researching and validating this topic for the co-chairs, Paul Volcker, American Assembly Trustee, and panel moderators. She interviewed academic experts, former and current regulators, and corporate leaders to compile an economic, business and public policy analysis. She worked closely with professors to develop current data to assess audit market dynamics, impact by market capitalization, and potential for diversification. Mike Cook and Charles Niemeier, of the Public Company Accounting Oversight Board (PCAOB), presented remarks. Distinguished moderators led a series of panels presentations. Throughout, participants actively discussed issues including auditor liability, capital market stability, regulatory responsibilities, and the role of judgment in financial attestations. According to the GAO, accounting market consolidation following the collapse of Arthur Andersen has resulted in the “Big Four" firms auditing approximately 97% of U.S. public companies with $250 million to $5 billion in sales and almost all with over $5 billion in revenue. This raises public policy and business concerns relating to competition and the security of capital markets – especially if another major firm fails. The American Assembly is a non-partisan public affairs forum illuminating issues of public policy by sponsoring research, conferences, and reports. Its publications are used by government, community, and civic leaders. Founded by Dwight D. Eisenhower in 1950. The American Assembly is affiliated with Columbia University. David Mortimer, COO American Assembly, Mike Cook, Rod Hills, and Stefanie Smith. View recent Podcasts and Interviews. Profit from Integration tips for M&A success.